Great Western Coffee Shop > All across the Great Western territory > Buses and other ways to travel > Nippy Bus (Somerset) folds? A question mark in the thread title because of the unusual way the MD of Nippy Bus chose to announce the closure of the business. I have had enough and realise I cannot work with you, the people I employ, a moment longer. There still comes a time in any relationship when you just have to say “f*** it”, say goodbye and move one. I am quitting to pursue my dream of not having to work here. 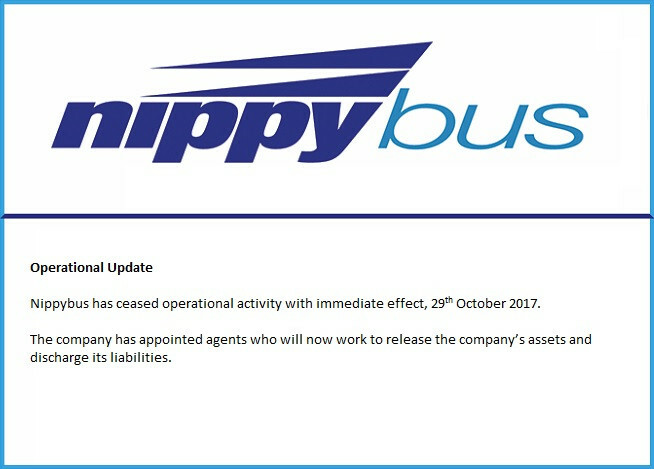 Nippy Bus has ceased operational activity with immediate effect, October 29 2017. All staff should now consider themselves dismissed/redundant. The gates are now closed and will not open so you can stay in your scratchers Monday and have a lie in. The company has appointed agents who will now work to realise the company’s assets and discharge its liabilities. The post and page have now been deleted. If that really was posted by the MD then it's a dispicable way to treat your staff. And seemingly sticking two fingers up to Somerset County Council (SCC) by making the announcement late on a Sunday. Nippy Bus ran tendered services for SCC, serving schools, colleges and rural communities. Along with a few commercial routes in Yeovil/South Somerset. It looks like that, yet again, SCC will be frantically looking to other operators to cover tendered services. The writing was on the wall last week after a number of services failed to turn up with the operator blaming "driver shortages". Well, if the Facebook post is representative of the management attitude at Nippy Bus then I'm not surprised they've lost drivers. Re: Nippy Bus (Somerset) folds? I have moved this topic to "The Rumour Mill", and changed the title of the redirection too; I saw a copy of the announcement elsewhere during the evening, and questioned whether it was genuine. If it proved genuine, I''ll move the thread back ... if it turns out to be a malicious prank (another possibility) then the last thing the MD wants is to have the prank propagated - he's probably got enough problems without fake news readable by all and sundry! Well, the MD has more to worry about than the odd forum posting about his company. I did pick up the story from the local press. I was intending to include a link to the news item but the forum went down as I was editing my post. Also, the full Facebook post included contact details for staff to collect personal belongings from the depot. That I didn't include for obvious reasons. The Nippy Bus twitter account has also disappeared. I believe the story to be genuine and not rumour. My questioning was merely about the way the announcement was made. When I first read that quote my heart leapt.....I thought it may have been from Hopwood's resignation speech...............it was only when I saw "Nippy Bus" that I realised it was from elsewhere! Taking a further look / further consideration, I now agree it probably is genuine. That announcement was very very odd - and was all I had picked up prior to your post. Story is covered at Somerset Live but that starts "online post suggests" ... so still leaves us 'single source'. Twitter under #nippybus also links back to same source. On the probably appearance of a confirmation, I'll move this thread back with an apology from me for my "knee-jerk" reaction a couple of hours back. Thread restored onto a public board - sorry I jumped and moved it prior to confirmation; news came out in a very odd way that made me reason to doubt its validity and classify it as "rumour". Rumour confirmed! 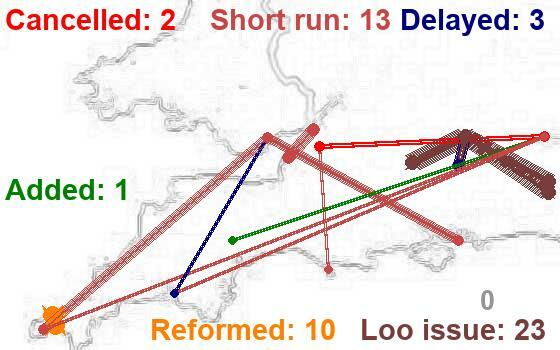 The number of operators who base their model on council tendered routes that are failing is concerning. Are they going too cheap and not allowing for base cost increases. Fuel has increased by close to 10p a litre in recent weeks. The council are legally required to award to cheapest operator. I know of an operator in cornwall who have done their council tenders based on drivers being paid minimum wage, and fuel prices on the day the figures were put together with no room for increase. The operators seem overly desperate for these low earning routes. Considering the rather unusual way in which the news was released, and the consequent initial doubts about its veracity, I wonder how long before someone puts out a similar but fake news release about some other transport operator ? Returning to the bus operator, does anyone know when the staff should last have been paid ? and if the wages due were in fact paid ? The last Friday of the month, or the 28th of the month are both common pay dates. A lack of money to pay wages cant normally be concealed for more than a day "failure of our banks IT systems" and "technical error" excuses are seldom believed. I would expect that some bus drivers might have been tempted to retain the vehicles in lieu of wages in such circumstances, hence the desire to get vehicles back to the depot before the news breaks. Non driving staff might be tempted to retain other company property, again a good reason to get everyone off the premises first. They might be tempted to, but they'd end up having a chat in the 'wrong' side of the local police station if they did. Especially if it was something as valuable as a bus worth many many more times than a drivers monthly/weekly salary. Still belongs to the company until the administrators have sold the assets and is a theft if retained. The only way you can legally get back what you're owed is by registering as a creditor with the administrator, wages would normally be one of the higher priorities. Based on some people I've worked with in the past, I can understand why the MD might've reacted in this way. It could very well be the way some of the staff have behaved has directly contributed to the failure of the company. Who knows, but it's a free world, a private company, the chap can spout off as he wishes as long as it's nothing illegal. I’m not sure your quite right. When western greyhound failed, a engineering firm who had a bus on their premises retained that vehicle as security for payment, and the administrators confirmed this in their report. It's probably different for another company - they may well have something in their T&C's stating that the vehicle is retained until payment is received in full - fairly normal for car repairs also. Vehicle may be sold on after x amount of time to recover repair and storage costs etc. They were lucky to have the bus in their possession when the company ceased trading rather than having to become a creditor or simply writing off the debt. An individual will not have any right in their employment contract to retain any company property after it has been terminated, in fact most employment contracts state that all company property is to be returned when the contact is terminated by either party, which is what happens when a company ceases trading. After this point I believe they become a creditor, unless the company is being run by the administrator as a going concern, which doesn't sound like the case in this instance. I don't see what a now ex-employee could possibly do with a now uninsured bus with no valid operators licence and no registration documents...? Seems like theft to me and I suspect, if involved, the police would view it in a similar light, in addition to assorted road traffic offences committed. Many children and students across south and mid Somerset, and north west Dorset, were left without school/college transport this morning. 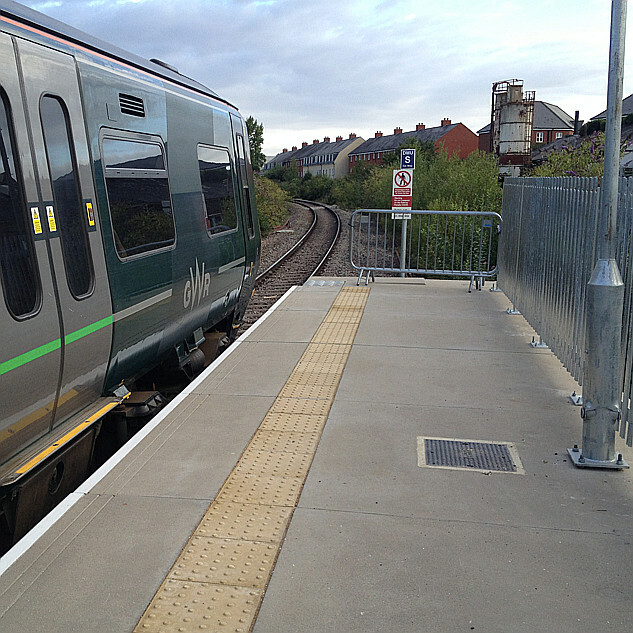 Many rural communities have lost their only public transport link to Yeovil or Taunton. Both Somerset and Dorset County Councils are in emergency talks with other operators to arrange cover for the Nippy Bus tendered school/college services. Buses of Somerset (First Bus) have issued a statement (see attached) saying they are in talks with SCC. Garages where repair / maintenance bills are unpaid would be covered by relevant clauses within their T&Cs regarding a lien over a vehicle or even as a common law bailment if the T&Cs are silent on the matter (unikely). It's an amazing way to close down a company. Sure it's a private company and the owner can do what they decide with it, but there must have been a clause in the operator's contract with Somerset CC requiring notice of eg a month to terminate the contract. Presumably with a penalty clause attached, but I wonder how high a priority that is in the creditors' claims?